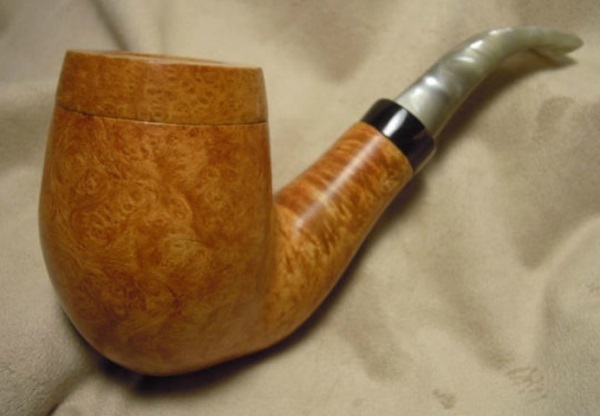 There’s a certain magic in holding a premium tobacco pipe when you consider the time, skill and labor that goes into making each one-of-a-kind piece of art. Some of that magic is undeniably lost when you convert to e-smoking and trade your pipe for a mass-produced piece of metal and plastic. Thankfully, some companies have constructed e-pipes fitted with the circuitry necessary for e-smoking. 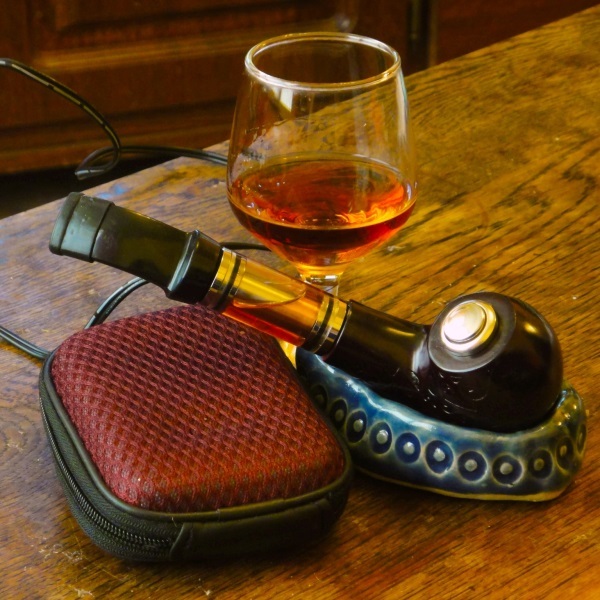 Although vapor can’t exactly replace the taste and sensation of pipe tobacco, holding one of these beauties in your hand will almost certainly make you miss your pipe a bit less. The big companies are getting bigger and smaller companies are getting stamped out, but one way small companies can still find great success in the e-cigarette industry is to find a small niche and totally own it. ePipeMods is certainly the best known of all e-pipe makers, and although their products frequently rotate in and out of stock, they’re capable of designing something to match any pipe smoker’s favorite design — including a few that real-life pipe designers can only envy. They also market a line of pipe-flavored e-liquids that they like to call “Pipe Sauce.” If you scan the ePipeMods forum thread on ECF, you’ll see proof that the folks at ePipeMods can produce practically any design you could possibly imagine. Although ePipeMods has largely owned the e-pipe niche in the United States, SunPipes has emerged as a competitor in Europe and the rest of the world. At the time of writing, only one of SunPipes’ products is available in the United States, but that may change in the future. Each pipe is unique, hand-made and includes fittings made from durable materials such as brass and copper. 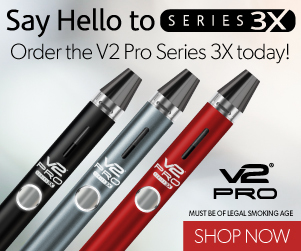 Although MikroPipes was founded with the goal of providing hand-made e-pipes to e-smokers for less than the competition, their products certainly appear to be no slouches. Many also include matching stands, something that’s typically a high-priced add-on. Unfortunately for American buyers, MikroPipes seems to be based in the United Kingdom — so you may be looking at some hefty fees if you want to make a purchase. However, I can’t find anything on the MikroPipes website specifying that they won’t ship to the United States. It’s pricey at 249 Euros and it isn’t immediately clear whether it’s handmade from wood or the design is simply airbrushed on an off-the-shelf plastic e-pipe, but the Crystal Grey Airbrush e-pipe from Liquid-Shop.eu might be just the ticket if you’re looking for something that wouldn’t be possible in a traditional tobacco pipe. 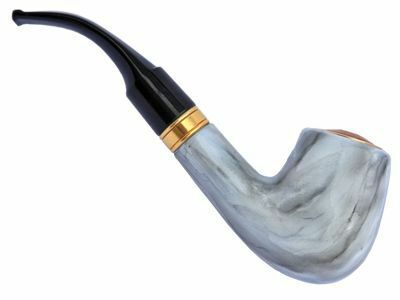 From the pictures, this e-pipe seems to legitimately resemble real marble. Although the description isn’t clear, it looks like the shank is designed to fit a standard 510-style cartomizer. You’d then place a plastic pipe mouthpiece over the shank, keeping the e-pipe’s internal components totally invisible. 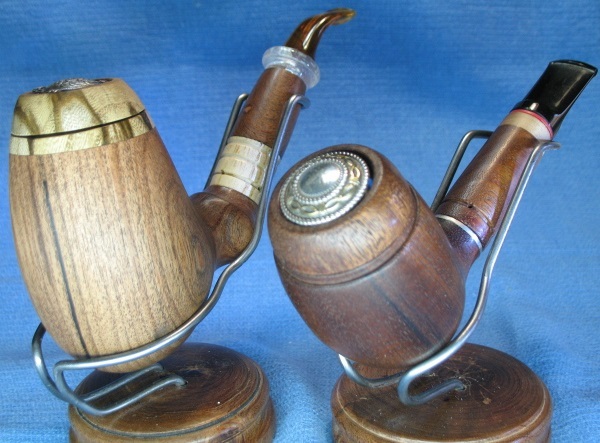 The downside to most e-pipes is the fact that, when viewed from the side, they clearly aren’t tobacco pipes. In order to be compatible with the widest variety of tanks and cartomizers possible, most e-pipes lack shanks. The Jazz Cartopipe shirks this trend, having a shank with an opening for a standard Boge-style cartomizer. A tank is also available, although it extends from the shank. Orders for the Jazz Cartopipe are periodically disabled as the maker’s queue reaches 20 pipes. However, an email address is available if you’d like to be added to the waiting list. One of the limitations of e-pipes is that, while being just as expensive as mainstream mods, they tend to be rather limited in power as they only support 3.7-volt operation. Mycroft, a UKVapers forum member, has solved this by creating a variable-voltage e-pipe with a power supply that can be carried in a pocket. To complete the look of a traditional pipe, he runs a wire from the power supply through his sleeve. Although that sounds quite cumbersome, the result appears functional and beautiful. Although they may be “just” a couple of DIY e-pipes, I think that even most mainstream e-smokers would be extremely happy to own one of these homemade carto-pipes by ECF member duckie_44. 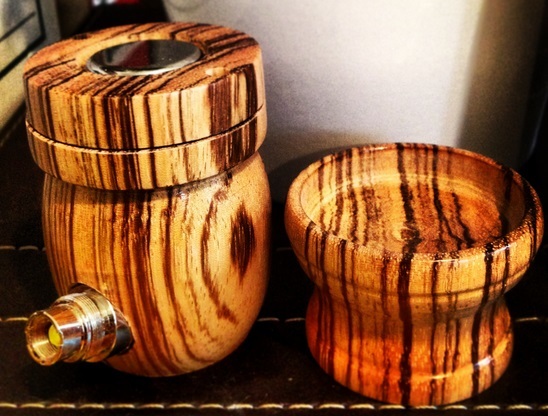 According to the forum thread, these e-pipes are painstakingly crafted from mahogany, mesquite and peach. They likely hold 510 cartomizers and are driven by 3.7-volt batteries with a simple mechanical button operation. Even the stands are hand-made. One of the problems with e-pipes is that they can be a bit limited in terms of cartomizer delection if you want the device to look like a pipe rather than simply a rather ungainly wood e-cigarette mod. 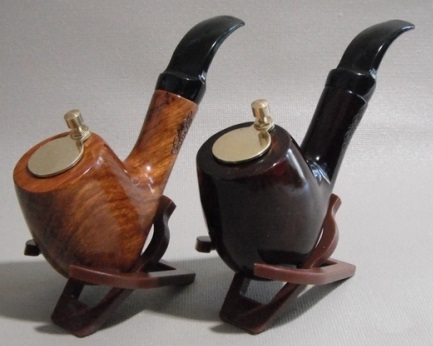 To solve this problem, some Chinese manufacturers have taken it upon themselves to design cartomizers and clearomizers with curved pipe-style mouthpieces. 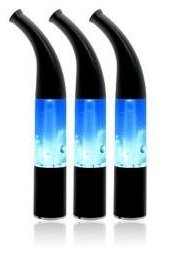 The Rocket Sax clearomizer holds 1.6 ml of e-liquid and might be a good fit for any e-pipe with eGo threading. It also has a little secret: a red or blue LED that lights up when you puff. That’s certainly likely to grab some attention!